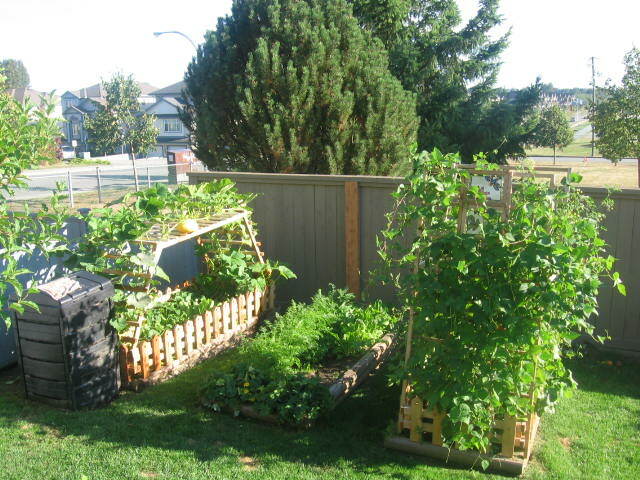 During the 2006 & 2007 growing seasons, our small vegetable garden continued to provide us with fresh vegetables. I rotated crops between the beds, so that heavy feeders wouldn’t completely deplete nutrients and to enable nitrogen producing plants to feed the soil. We also added lots of compost and lime to our acidic soil every spring. I built a ladder lattice to extend our growing space. My theory was to grow squash or cucumber vines up and over another crop. I choose lettuce and spinach to be grown on the ground level, since they prefer cooler temperatures and can tolerate some shade. The experiement was a success! My trellis worked well, supporting the winter squash and for shading the heat-hating lettuce. After the 2008 harvest, we realized that tending the lawn was a useless waste of time and space. What we needed was more room for the vegetable garden. With more garden space we would not only eat fresh food all spring & summer but also be able to preserve any surplus for colder months. Transforming the back lawn to food production was quite an easy descion for us, since our property back onto a park. If we needed more green space, it was right out the back gate. We did, however, decided to leave a token patch of green for the dogs. We took a trip to the local Recycle/Reuse store and found several old planks of untreated wood. They were purchasd for $1 per foot and loaded on to our small truck. That’s correct, loaded “on to” not “into” our truck. The long, heavy planks were stack from its roof out over the tail gate and strapped on with red bungies. With the load securely attached, we were on our way for the 20 minute drive home. All was going to plan, until we bounced over some train tracks and the weight of the lumber broke the tailgate. So much for saving money this time. The planks were trimmed and laid out according to my drawings. 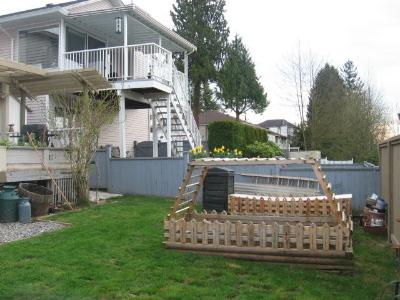 I allowed for ample space between the fence and the raised beds. It was just going to be shady there anyways. I also allowed for 2 feet between the 2 boxes, so the lawn mower could be used on the pathway. Dave cut 4×4 posts into appropriate lengths to secure the corners. 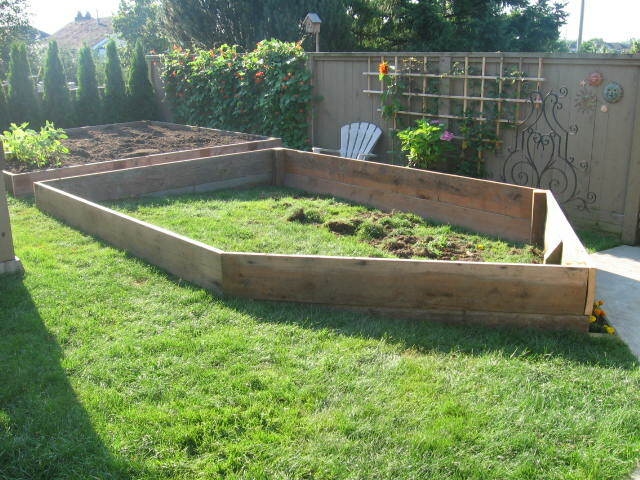 After the landscape ties were removed, planks were placed around the original 3 raised beds. I believe this square section was 12’x 14′ equaling 168 square feet of growing space. 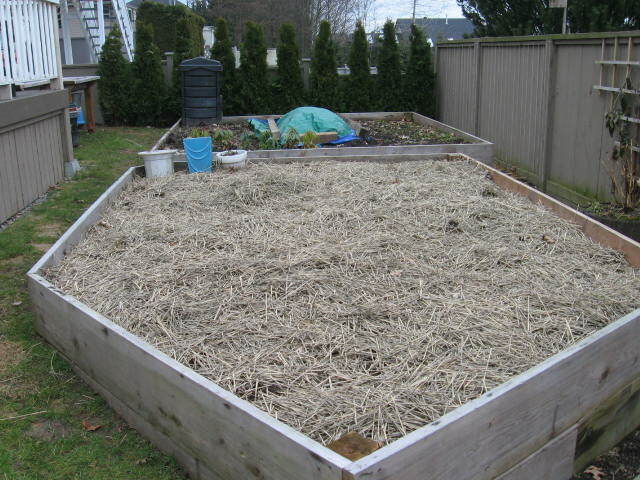 After organic composted soil was wheelbarrowed in to fill the first plot, a second garden plot was built. 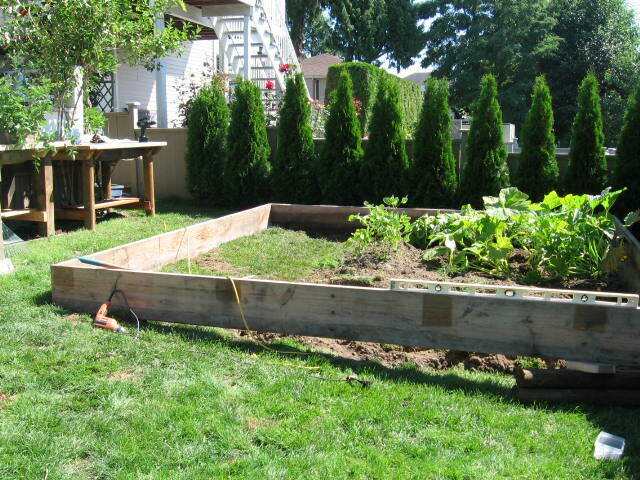 This second plot was not as wide but longer than the first, giving us another 160+ square feet of vegetable garden space. To the right of the picture, you can see the cement pathway that leads to the back gate. It took many, many wheelbarrows of soil to fill plot #2, but the effort was worth it! I think this picture was taken in September 2008. 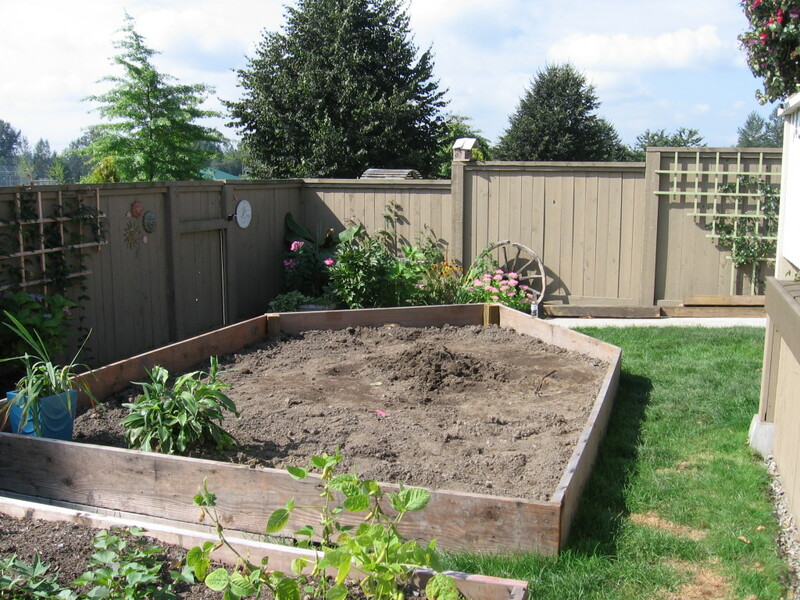 We were getting the vegetable garden setup to allow for an early start in 2009. The new plots full of organic soil, tucked in and put to bed for the winter. I spent a lot of time after this photo was taken, dreaming & planning my vegetable planting strategies for the following spring.